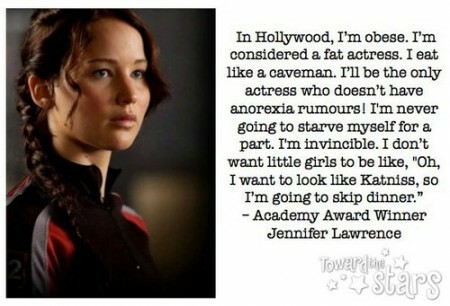 Hollywood really needs a kick in the pants if they think she is “fat.” Most people dream of looking as good as she does. The next time you look at yourself in the mirror and wish that you looked more like an actress, remember that your idol is under EXTREME pressure to literally STARVE herself to look like she does. Don’t judge yourself by Hollywood’s insane standards. 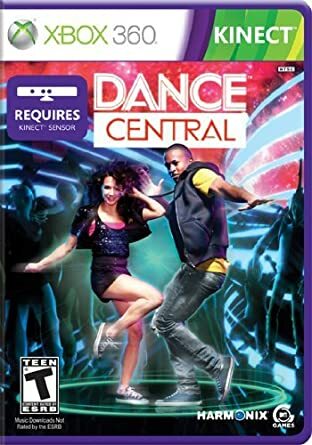 I just realized that every time I play Dance Central on the Xbox, I probably look like this but even WORSE! I’m gonna get fit anyway! Via: Geek Culture – Michelle Obama rocks! When I started watching this video, I thought Riffraff67 was a cute little guy and I was going to enjoy watching him play Dance Central 2. It was a song I haven’t played yet, so I was just interested is seeing how the moves went, but I found myself entranced by Riffraff67’s dancing! While I was watching this video, everything I had thought about this guy at the beginning evaporated like water spilled on a hot stove. I thought he was cute and kinda cuddly before the video started, but afterward, I thought he was a DANCE GOD! The next time you feel like you’re not in good enough shape to do something, remember Riffraff67’s dancing. With enough practice, it doesn’t matter what your body looks like. All that matters is how good you can do what you are doing. Whatever it is that you like to do, get out there and practice! Practice! Practice until you can do it with such grace and skill that no one can argue with how awesome you are. If you have been letting your New Year’s Resolutions slip, here is a video to get you back on track. It’s called “This Is The New Year” by A Great Big World [iTunes link]. The lyrics and tempo of the song are so upbeat, it doesn’t matter who lip syncs the song. If you have fallen off the wagon, get back on and put this song on your workout playlist! 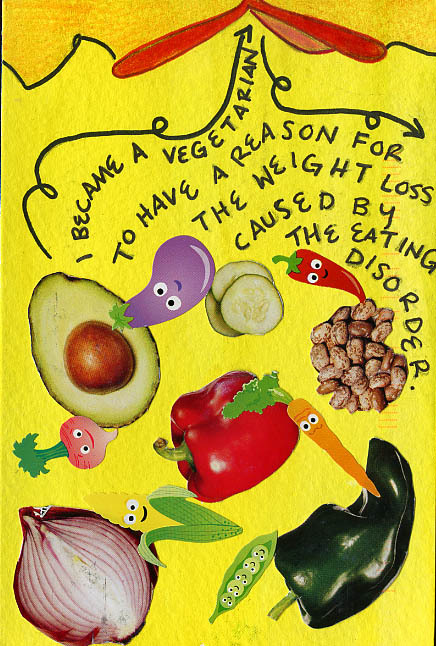 This week on PostSecret, they recognized Eating Disorder Week. 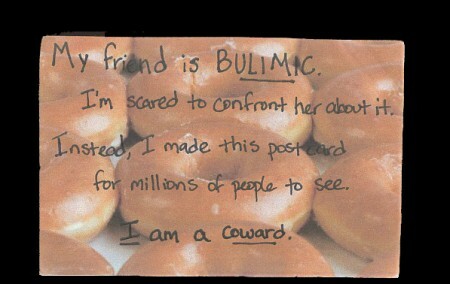 They posted a bunch of postcards about eating disorders. Eating make me feel vulnerable. Starving give me strength. My favorite habit is putting red lipstick on after I throw up. 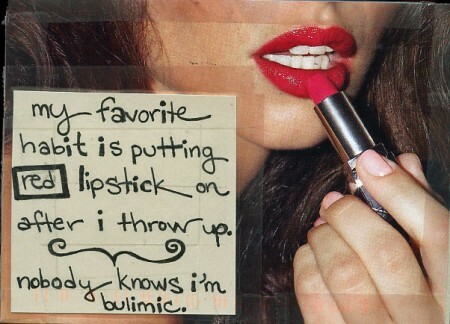 Nobody knows I’m bulimic. My friend is bulimic. I’m scared to confront her about it. Instead, I made this postcard for millions of people to see. I am a coward. 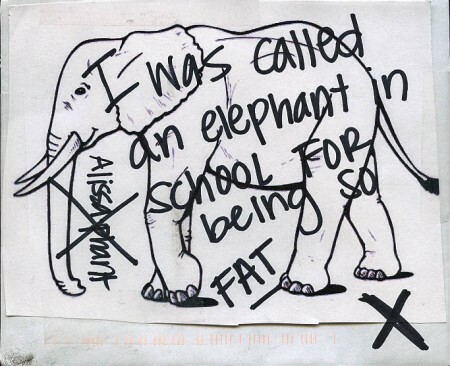 I was called an elephant in school for being so fat. I became a vegetarian to have a reason for the weight loss caused by the eating disorder. If I were honest about my eating disorder when my mom asked me about it when I was younger, I could have saved myself from 8 years of hell. 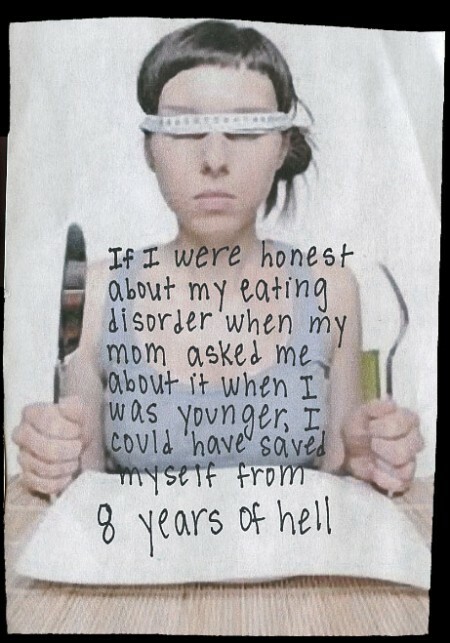 Even though it made me completely miserable & sickly, I miss my anorexia every day. The National Eating Disorders Association has a quiz you can give yourself to see if you have disordered eating. They have some support options to help you and refer you to a professional, so if any of these secrets ring true to you, please contact them. Back in 2004, when I fell in love with Yourself! Fitness, I dreamed of a game that could tell if I was doing the moves right or not. 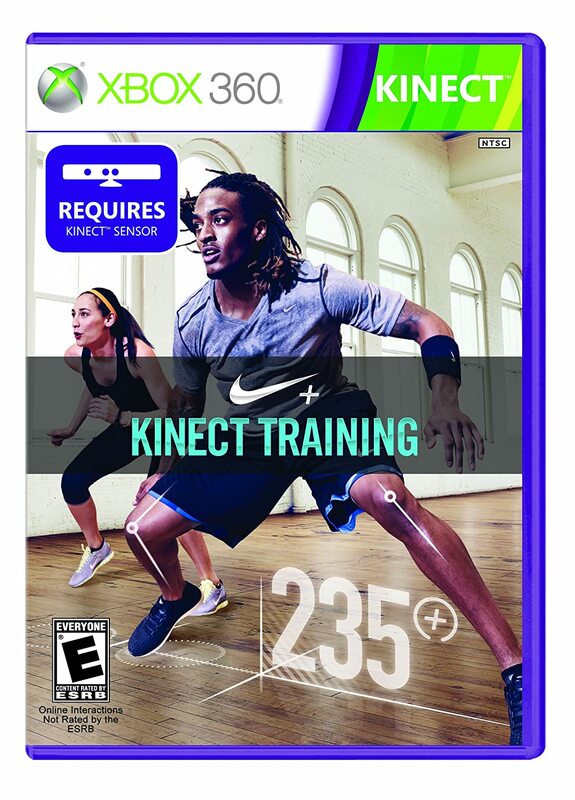 With Nike+ Kinect, it looks like that dream has finally come true. I haven’t tried this game yet, but there are lots of videos on YouTube, showing how the game plays and what it does. I’m excited about it and I can’t wait until my copy comes in the mail! Here is a quick video showing a five minute drill. I love the moving obstacles in Split Decision. It reminds me of a Japanese game show called Human Tetris. You can see full-blown workouts on YouTube. This guys shows everything, so if you want to try to workout with it, you can. It looks like a good workout game with lots to do. Some people complained that they had to have LOTS more room than they usually have for Kinect games, so that worries me a little. In nine short years, exergaming has gone from Maya telling me what to do and never knowing if I was following along or not to a game system that can see my every move and log each rep and whether I did it correctly. It’s one of those rare times when I am pleasantly surprised at how much technology has advanced! This blog post from CrossFit204 is brilliant. There are no mirrors in our gym because we don’t care what you look like. In fact, we don’t care how old you are, or whether you’re male or female. We don’t care what colour your skin is either. Or if you’re overweight or loaded with muscle. Or if you’re tall or short. Or blond. Or brunette. We treat everyone like an athlete, and there’s no profiling here. We’re actually putting mirrors in the bathrooms very soon. But they’re not there for you to evaluate your appearance. 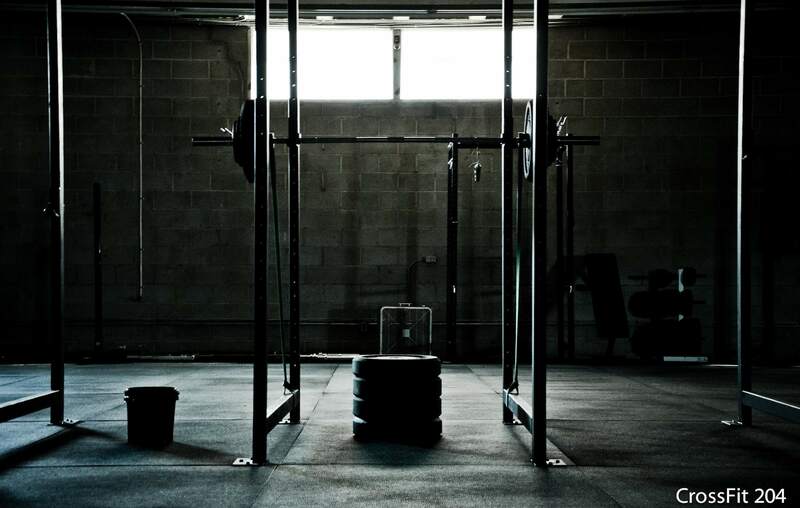 Did you give your very best effort in the workout? 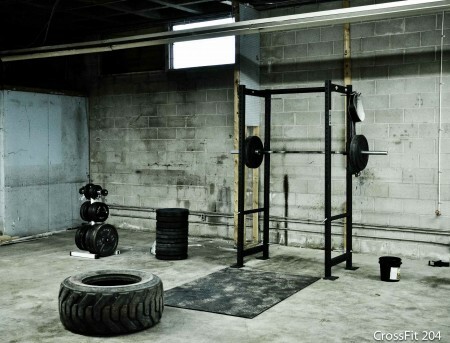 If you live in Winnipeg, you can join CrossFit 204 and actually work out in that mythical gym without mirrors. If not, click on over to the CrossFit 204 blog and read the entire post. It’s truly inspirational. 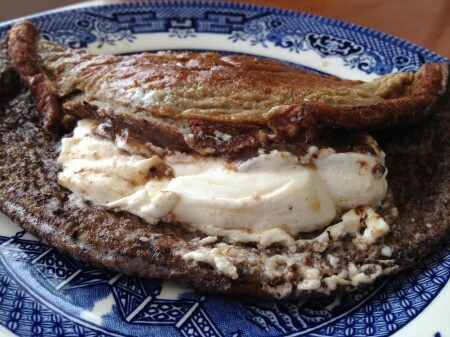 Last July, I invented one of my favorite breakfast treats, called the Chocolate Cream Cheese Omelet. Every time I make it, it’s uglier than the last, but it tastes like a deliciously chocolate pancake, despite not having a lick of flour in it. Last Tuesday, I figured out how to make it ever so slightly better. The original recipe had you heating a tablespoon of butter in the pan so the omelet wouldn’t stick. I used a tablespoon of coconut oil instead and the flavor was divine! It adds about twenty calories to the recipe, but the coconut flavor of the oil pairs so well with the chocolate and cream cheese that it’s worth it. When you eat low carb, it’s really easy to eat too much protein. In fact, the biggest mistake rookie low carb eaters make is eating too much protein. You have to LOOK for ways to add fat to your meals in order to keep your percentages at a level that won’t give you gout. Adding coconut oil to my chocolate cream cheese omelet gives it a boost in flavor and some well-needed calories from fat. The next time you’re at a loss for what to eat for breakfast, try my chocolate cream cheese omelet and give yourself a treat!